In this review, we’ll be taking a look at the Dirt Devil Scorpion Quick Flip Hand Vacuum (SD20005RED Model). The Dirt Devil Scorpion Quick Flip is named because of the quick flip nose along the front of the vacuum. 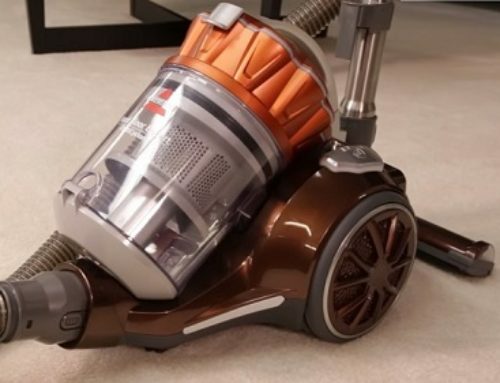 The vacuum can be used as is, or if you need a little bit more cleaning length, simply hit the release button here that unlocks the quick flip nose. You slide that in to lock it into place there and you’re good to go. The Quick Flip also includes this hose, which is about 2 feet long, something we’ve not seen in very many other handhelds. That simply slides into the main little suction slot there, giving you a little bit of extra length if you need it. Lastly, we have the dusting tool. That also simply slides into the suction slot and then you’re all ready. This vacuum is 13.7 inches long and 8.5 inches tall at its tallest point. Additionally, the vacuum is 6.4 inches at its widest point. 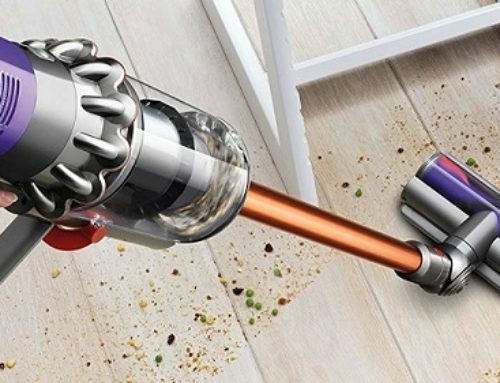 The cleaning head is 1.75 inches and the vacuum weighs 3.75 pounds. We complete a total of 12 unique cleaning tests testing each of our four debris types on three different flooring types. For each of our cleaning tests, we make cleaning passes back and forth measuring the amount of debris that is removed from the cleaning surface. Our testing line includes three different floor types: engineered hardwood floor, low pile carpet, and a high pile carpet. On each of our floor types, we test four different debris types including: rice, kitty litter, cereal, and sugar. Cleaning performance on the Dirt Devil Scorpion was exceptional overall, especially on hardwood floors and the low pile carpets. The performance showed 95% cleaning debris removed or better for each of the tests. During our high pile carpet test, we did see a slight decline in performance, most notably on the kitty litter and sugar portions of our debris test. However, even on those tests, we still saw performances of 87% or higher for the cleaning debris removed. As far as usability goes, this vacuum is pretty easy. There’s just not a whole lot to it. Simply plug it in, turn it on, and start cleaning. I definitely like the quick flip portion of the unit is actually held on the unit itself. Being able to simply pop that out so you have your crevice tool is definitely a nice addition. Beyond that, there’s just not a whole lot more to say about usability on the Dirt Devil Scorpion Quick Flip Hand Vacuum. It’s quick and easy to use, set up is easy, and just gets the job done. Maneuverability on this handheld vac is overall pretty good. 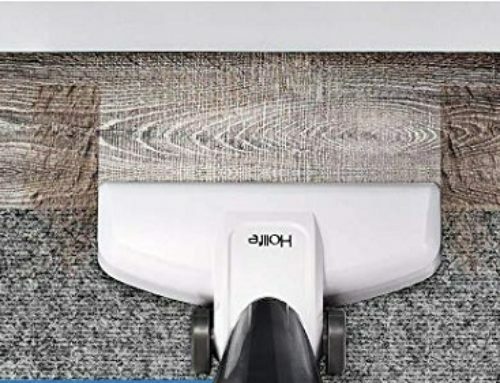 In terms of weight, it comes in a little bit under four pounds, and while not cordless, the cord is 16 feet long so you have more than enough length to do just about everything you need to do with a handheld vacuum. Maintenance is fairly straight forward on this handheld vacuum. Simply hit the release button, which detaches the front of the unit. You simply remove the filter for cleaning or replacement and then empty your dustbin into the trash as needed. The only major maintenance task each year is going to be replacing the filter every few months, three to six depending on use, and that’s going to cost you around $10 a year. All our vacuum reviews go through our standard noise test. For this test, we use a sound meter to measure noise in terms of decibels. As this unit is an AC powered unit with a lot of power and a lot of suction, it was coming in at around 85 to 86 decibels. Overall, I really like the Dirt Devil Scorpion Quick Flip Hand Vacuum. The price is usually around $30 making this an incredible value considering the performance. During our cleaning test, it did very well, scoring 87% or higher on all of our tests. And it also includes a number of pretty nice accessories. We have the quick flip head, of course, on the front attached, in addition to the hose and dusting brush as well. The last major pro is simply maintenance which is very easy. All you really need to do is release the front, keep the clean filter, replace as needed, and empty the dustbin. Annual maintenance costs on this guy are only around $10 a year. As far as the negatives go, I really don’t have anything significant to point out on this vacuum. If I was being really nitpicky, I might say it’s not cordless, so there’s a negative there, or it doesn’t have a motorized brush roll. And while these things might be considered negatives for some people, for a vacuum as inexpensive as the Dirt Devil SD20005RED Scorpion Quick Flip Hand Vacuum, is, considering the other pros, I really think those are pretty minor by comparison.